I'm really glad I didn't start getting tattoos when I initially wanted to. At 18, I would have a lot of really dumb Dawson's Creek quote tattoos (probably in some form of Chinese character to keep things mysterious.) or an ode to Garden State on my lower back or something along those awful lines. Luckily I pussed out around every turn and didn't get any when I was young. [Tangent: I live under the assertion that people aren't the people they truly will be until they are 25. At least that's how I was...and most everyone I know. Before then you are still in the long "figuring it out" stage.] Fear wasn't the issue...indecisiveness always was. Luckily, now that I am creeping towards 34, I have a much easier time making decisions...which means over the last month, I have been acquiring a new tattoo. [Tangent: It took a couple sittings because my badass self thought a rib tattoo would be no biggie. It twas not. It hurt like someone was trying to dig into my rib cage with a salad fork. My threshhold for pain is generally fairly high. I sat with a smile on my face when I got my foot done...but this was PAINFUL. 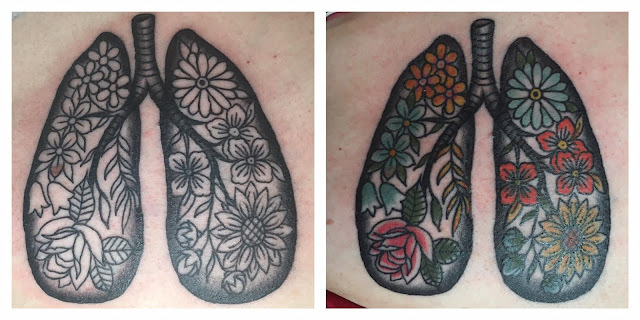 My friend Rae, who went with me, said it convinced her never to get her ribs done...and she has TONS of tattoos. Let's just say I got the studio got bombarded with many deserved F-Bombs and S-Grenades on day one. It was my personal war zone. The coloring day, which was yesterday, was thankfully a breeze! 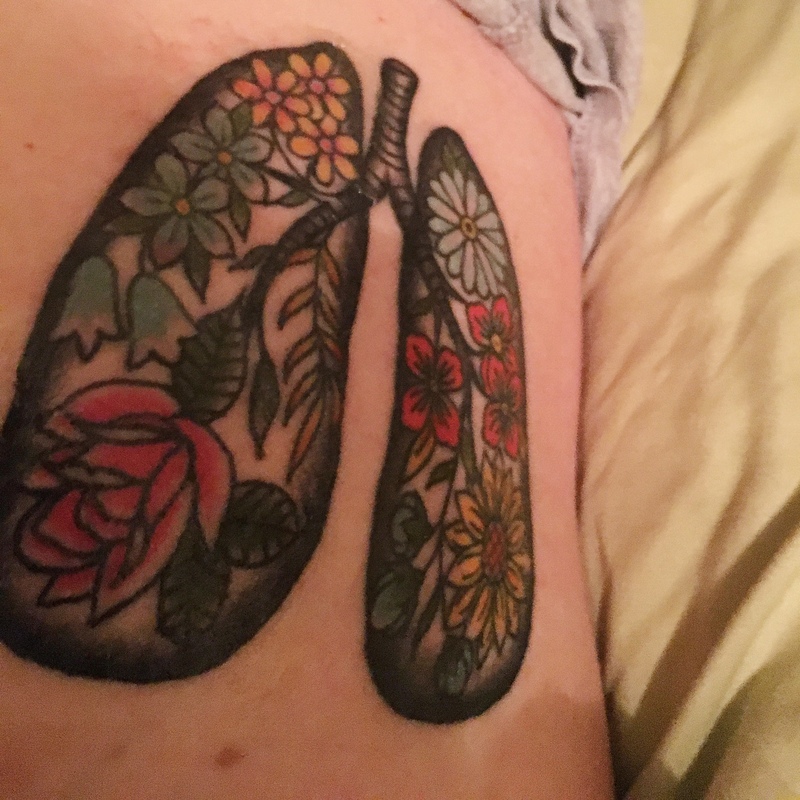 Why did I have to decide to get it over my actual lung!?! Why did I have to want tattoos in the two most painful locations? I'm an idiot.] For the last roughly 9 months, I have had crazy insomnia, which leads me to come up with a lot of hare-brained ideas and attempted late night vision quests. The idea for this tattoo was the result of this. Even though I was halfway tempted to leave it black and gray so I could be a human coloring book [Tangent: My niece was super excited about that scenario...even though the concept of a tattoo is a heady one for a 5 year old. She tries to rub the one off my foot. ], I'm even more in love with it after getting it colored. So much so that I want to show it to everyone...which is pretty much me pulling my shirt up at the drop off a hat revealing my pale scarred up short-waisted belly to anyone showing an ounce of interest. [Tangent: Yeah...bitchin gallbladder removal scars make me look like I was felt up by Edward Scissorhands or Revenent style bear attacked.] I'm that person now. I'm the kind of person who is contemplating wearing a bikini top as a well...top. I mean, I won't....but I'm considering it. I mean...look how freakin' pretty it is! Wouldn't you?